An atmosphere of tranquility awaits you in County Monaghan. 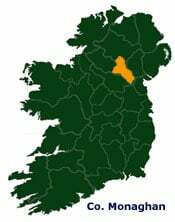 Its undulating countryside amidst the midland’s drumlin belt, dotted with lakes, gentle hills, farmhouses and market towns makes Monaghan a scenic and relaxing haven. It is the perfect destination for the serious angler, casual golfer, walker or cyclist who prefers the peace and quiet of winding country lanes. This is a country of great cultural and artistic wealth, with several Bronze Age megalithic sites and pre-historic remains. The poet Patrick Kavanagh found his early inspiration here at Inniskeen, where there is now an information center on his poetry and life. The famous lace-making towns of Carrickmacross and Clones are world renowned for their traditional crafts. Recent developments include the re-opening of Monaghan County Museum, Lough Muckno and the leisure park at Castleblaney. Visitors to County Monaghan will be surprised at the diverse range of activities and entertainment available to all in this beautiful area.